"We've seen a lot more labs," said Glenn Haas, the resident agent in charge of the Drug Enforcement Administration office in Springfield. "However, the labs we're seeing in Illinois are smaller than what we've seen in the past." Some meth operations are large. Tena Logan's involved a three-year period with dozens of people making hundreds of purchases of pseudoephedrine, a key ingredient in the making of meth, according to court records. There was no evidence she ever purchased pseudoephedrine during that time. Other operations, such as Pasley's, are small. He was charged with possessing and manufacturing more than 900 grams of meth before pleading guilty to having and making less than 15 grams. Meth is often made by using a collection of different household materials, which sometimes include lithium batteries, starter fluid and Coleman fuel. "I wouldn't buy it because it was so easy to make," he said. "A 6-year-old kid can read, and a 6-year-old kid could tear open a package of oatmeal and put water in it and put it in the microwave. We'll use that analogy." Pasley said he would make enough meth to satisfy his cravings and then sell the rest to buy supplies for his next batch. His preferred method was to use anhydrous ammonia, which required more pseudoephedrine than the so-called "shake-and-bake" method. Because of his preference, he had to experiment with other recipes at times. Law enforcement officials said Pasley's operation was typical of meth users, who run their own smaller, personal operations focused on cooking a day's worth of meth. "We're seeing a lot more of those than we are the bigger labs," said Troy Phillips, director of Vermilion County's Metropolitan Enforcement Group, Vermilion County's drug task force. A key ingredient in meth is pseudoephedrine, which is found in some common cold medications. In 2010, Illinois joined a coalition of 26 other states that placed restrictions on pseudoephedrine sales by limiting purchases to a certain amount for each customer in a 30-day period. But meth producers have started using other methods of gathering the drug -- including a system known as "smurfing." When the state first began cracking down on pseudoephedrine purchases, pharmacies only had to keep track of the purchases via pen and paper. Law enforcement officers had to go to each pharmacy to check their individual logs in a "tedious" process, said Don Payton, statewide clandestine laboratory coordinator for the Illinois State Police. For instance, they often use Logan's strategy of recruiting a large number of people to purchase legal limits of pseudoephedrine and combine them all, Haas said. The method is known as "smurfing." The names of everyone who purchases pseudoephedrine goes into the database, even if they don't exceed the legal limit. If somebody tries to purchase more than the legal limit, the database alerts the pharmacy to reject the sale. "We've seen a lot more labs. However, the labs we're seeing in Illinois are smaller than what we've seen in the past." - Glenn Haas, the resident agent in charge of the Drug Enforcement Administration office in Springfield. Agents are still able to see those who were denied sales, however, so it can still be effective, said Chris McGuire, special agent and Chicago's divisional clandestine laboratory coordinator for the Drug Enforcement Administration. The only real difference is that you no longer get the "super idiots" who used to buy excessive amounts of pseudoephedrine, he said. Payton helped implement the electronic pseudoephedrine database, and said he believes it has given Illinois State Police "a lot better ability to see who's doing what now." The pseudoephedrine tracking system helped locate 292 of Illinois' 785 labs seized in 2012, Payton said. There were also 687 meth-related arrests, 397 of which were attributed to using the database. Meth-related arrests include people who are involved with meth production, possession or distribution in any way. The agents at the Illinois State Police's Zone 5 Meth Response Team were present for the lab cleanup at Tena and Paul Logan's residence. After seeing hundreds of meth labs, master sergeant Mike Atkinson has come up with another term for them. "They should be called 'meth dirty kitchens,'" he said, because science and cleanliness are uncommon for meth operations. 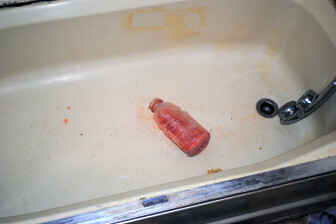 Mike Atkinson, a member of the Illinois State Police's Zone 5 Meth Response Team, said a more accurate term for "meth lab" would be "meth dirty kitchen." 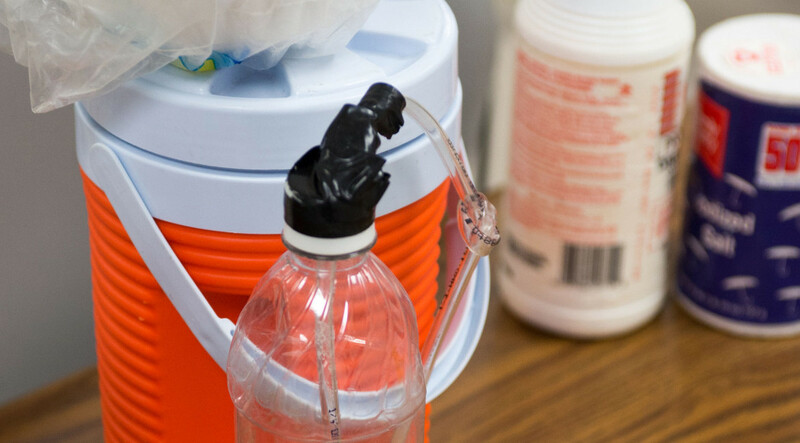 Atkinson's team is responsible for the cleanup of every meth lab in east central Illinois. But cleaning a lab does not necessarily mean making the facility, residence or car safe for people to enter. The agents only collect evidence and remove the materials and chemicals. The rest of the mess and contamination are left to private contractors at the owner's expense, should the owner choose to hire them. Illinois does not have any requirements for landlords or homeowners to clean up after a meth lab. There is a typical profile for users of "white person's crack," said Marc Richards, special agent at the Meth Response Team. Some addicts will recruit African Americans for their smurfing operations because they aren't the "skanky whites" police officers typically deal with when rooting out meth, he said. Even for many lifelong drug abusers, meth is something they never want to be associated with. 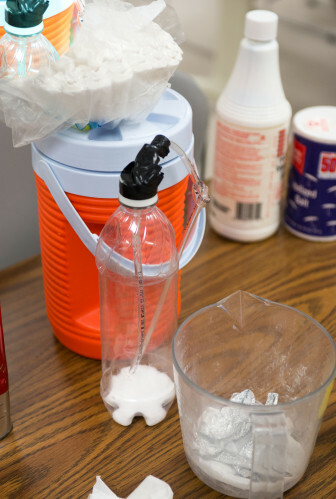 Brandon Underwood, addiction counselor at The Prairie Center's outpatient facility in Urbana, Ill., said he has heard the worst addicts of other drugs describe meth as "the lowest of the low," and swear they would never touch it. Even Vermilion County does not see many meth addicts, said Susan Perkins, director of The Prairie Center's office in Danville, Ill., despite the county having the second most lab seizures in 2012. The number of meth addicts they see has been declining over the past few years, she said, while the number of lab seizures is increasing. Meth use in central Illinois is unlike the popular drama "Breaking Bad." "There is very little violence connected with meth in central and southern Illinois," Weisheit said. 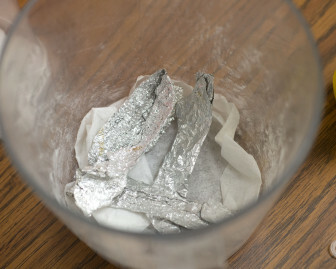 Another common household component used for making meth is aluminum foil. 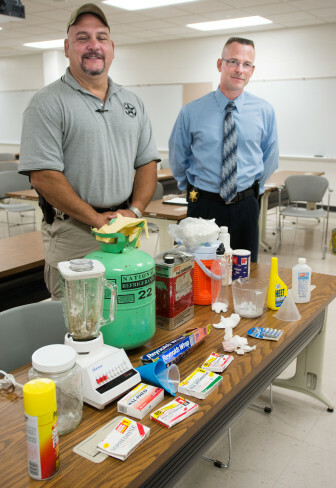 Here, authorities display more meth lab items. "Many people step on it before it hits the streets," he said. There is a historical trend that shows future generations tend to underestimate the danger of the drugs of past generations, Weisheit said. Stimulants and narcotics trade places as the main drug of choice. But as for which drug in particular will arise next, it's never easy to say. "Drugs are like fashion," Weisheit said. "It's hard to predict why drugs become popular."